At Game Room Guys we’ve heard all of the stories; from the woman who used to play Galaga while trying to keep balanced on her roller skates, to the guy who won his first kiss after showing off his Pac-Man skills. 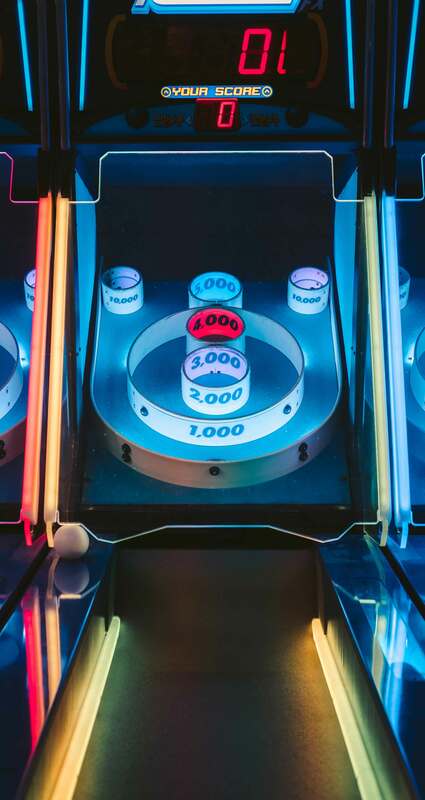 Arcade games have this ability to conjure up so many memories from the best parts of our childhoods. They take us back to a time where worries were less and magic was real. Today, achieving your childhood dream of owning your own arcade game has never been easier! Take a look at this handy buying guide to learn more about the process of finding and buying your next favorite game. Basketball games allow players to test their skills and throw real basketballs in a net. These games can be linked together where multiple games can be going at the same time, so you can test your skills head to head. they’re still just as fun to play as adults. From small rubber duckies, to large stuffed animals, there’s a crane for every preference. Popularized in the 90’s with Dance Dance Revolution, these games are a hit with people of all ages; offering a fun way to compete, exercise, and test your skills. Whether it’s driving a race car, jet ski, or even a pod racer, these games let players race in unlimited settings. A favorite of many visiting their local arcade, gun games have realistic looking guns and can involve anything from hunting deer to killing zombies. We’ve all heard of GoldenTee, the popular staple in many bars and game rooms, but did you know it can also come with SilverStrike bowling? But GoldenTee isn’t the only golf game available, there’s a mini-golf game called Putt!, as well as high-end golf simulators from Full Swing. If you’re a golfer, you need to check these out! Redemption games come in many styles. 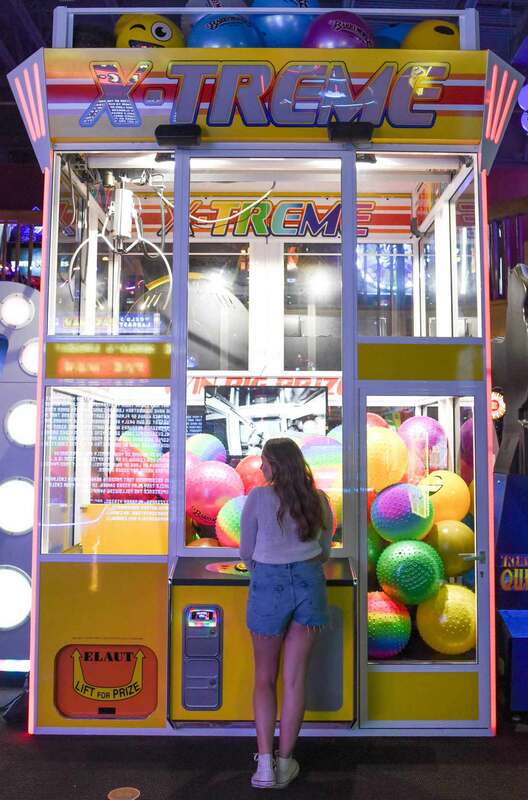 From the classic Skee Ball, offering tickets, to more modern prize games like Namco’s Dunk Tank Prize redemption game, where you can win high dollar items. Many games in the other categories can also be categorized as redemption games. The most classic of all arcade machine types, video games include such infamous games as Pac-Man and Galaga, but also includes multi-cade cabinets with hundreds of games. Sure, the driving games and gun games, among others, could be considered video games, but as the classic gamers will tell you, video games are best defined as having a joystick and a few buttons. • Who will be playing it? Just adults? Teens? Kids? • What type of games do you want? Sports? Hunting? Stand up or sit down? • Where will it go? Man cave? Game Room or family room? Garage? • When do you want to get it? Some games are made to order, so they could take a month or more to arrive. • How much are you willing to spend on a game? Arcade games can vary in cost from $1,500 for small table top models to over $29,000 for larger games that fully immerse the player. For commercial areas, the price can be recouped over time through the use of coin mechanisms, dollar bill acceptors, or card scanners. To save money, you can also consider buying used or freight damaged games. In these instances, the game is like new and works perfectly but might have some visible scratches or chips to the cabinet. If you don’t mind a little imperfection, it could be worth saving $500 or more. Additionally, Game Room Guys has financing options available. Arcade games don’t require much maintenance. To preserve cabinet art, avoid putting the game near direct sunlight. Keep your game clean and dust free, by regularly wiping it down and cleaning the computer with canned air. Also, stay on the lookout for software updates. If you are using your game in a home environment, all new games come with the ability to turn on “free play”. If you are buying a game for a commercial location, most games can have a coin mechanism, dollar bill acceptor, or card scanner installed. If you’re anything like me, you might even think it’s fun to have your own custom tokens to use in your personal game room. Games come in a variety of sizes. From the size of a breadbox to the size of 4 cubicles. These large games come in multiple parts so they are easier to transport, but they might not fit through standard doorways. Before buying a game make sure to get the dimensions and verify that it will fit where you are putting it (including any hallways, stairways, or sharp turns). As for the electrical requirements, most games can plug into a standard wall outlet. 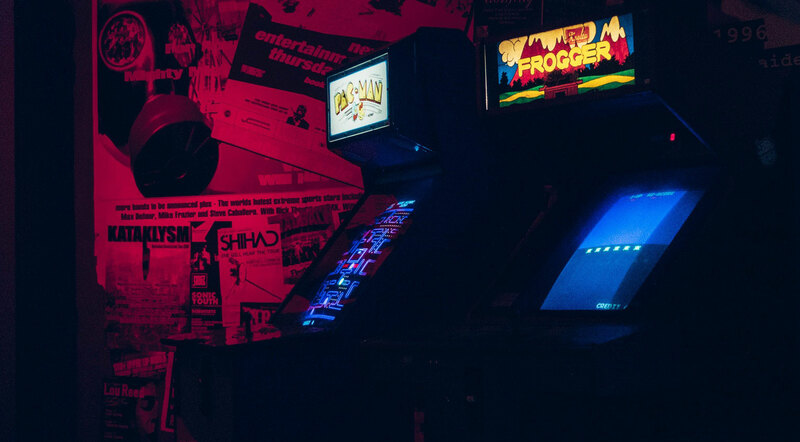 We might be biased, but Game Room Guys is the best place to start and end your search for the perfect arcade game. With a great selection of games, world-class customer service, and lifetime phone tech support, Game Room Guys is easily the best choice for all of your game room needs. If that’s not enough, every item, no matter the size, comes with free curbside shipping. If you want to come see a game, check out our showroom in Grand Rapids, Michigan. You’ll be glad you did and we’ll be glad to meet you.